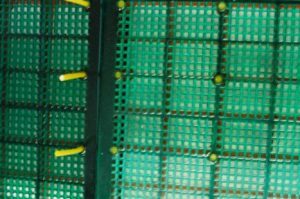 Redwood Plastics and Rubber manufactures a wide range of cost savings recyclable polyurethane screens and screening related products essentially for mining and quarry industries, including diamond mining. Not only is our system a cost saver, but also reduces the waste going to landfills up to 80%. There are no steel bars inside the panel for structural support. Up to 1,5 kg (3.3 lbs) of waste per square foot is generated by most other systems. This waste goes directly to landfills since it is impractical to reclaim the structural steel support inside of them and not viable to grind up or re use the polyurethane from which the surround was made. It is found that about 20% of the total screen is used efficiently before scrapping. If an unscrupulous manufacturer produces 20 tons of screen per month, only 4 tons are used effectively. That means 16 tons of waste is scrapped per month, amounting to 192 tons of waste generated in a single manufacturer in one year. It is in interest of the environment to do everything in our power to preserve our natural resources, especially when it is possible to do so without jeopardizing reduction and actually costing one less in doing so. When the surface is worn down, the surface is simply removed and replaced. 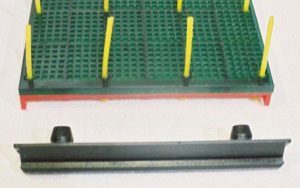 The panel is easily removed from the clip rail when replacing or rotating to ensure even wear. 1 x square foot wear surface. 1 x sub frame to accommodate 1 square foot of wear surface. 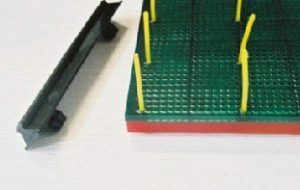 This screen clip rail not only secures the screen panel, but also protects the steel frame structure from wear and tear caused by the material being screened. This hard wearing clip rail need not be replaced when the screen is replaced or rotated. Due to the shape of the clip rail, the dead area is reduced and the open area increased. This lightweight screen wear surface is easily replaceable. Each square foot is provided with 12 holding pin holes through which the pins are used to hold the surface down onto the rigid subframe. This extremely tough surface is available at a cost-saving without jeopardizing the open area or screen life. The added advantage is that one pays for what one uses. 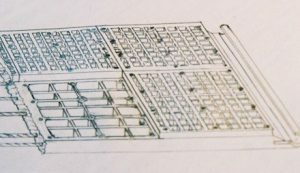 Most other panels on the market are part of the large bulk, which is eventually discarded. Unfortunately, the customer pays for the part he uses as well as the discarded part. 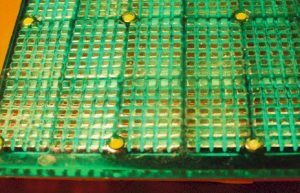 The discarded part usually consists of approximately 80% of the weight of the total screen panel, about 3 lb per square foot. The Greenscreen wear surface typically weighs about 5 oz per square foot when worn down. That consists of only about 10 % of competitor’s screen panels. This sub frame is hard and tough without any steel stiffeners to ensure stiffness. The sub frame is reusable while the top wear surface is replaceable. Reinforcing bars or rods are impractical to reclaim and are lost forever when the screen is discarded. For this reason, reinforcing bars are absent in Green Screens. A true tension screen with a difference. 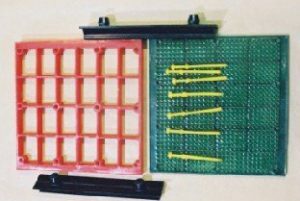 This tension screen has an undercarriage made of tough polyurethane and is tensioned over hooks and reinforced with steel rope. 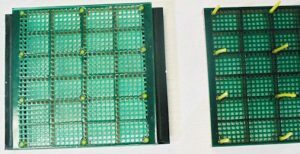 The difference is that it has a replaceable wear surface, made up of replaceable panels, making this unique screen extremely cost effective. 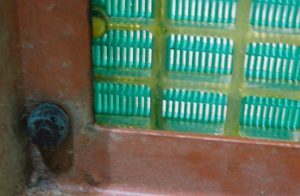 The tension under-carriage is designed to last against several replacements of the wear surface, provided that the wear is not allowed to erode past the wear surface. Apertures between 1.0 mm (3/64″) and 150 mm (6″). Custom aperture shapes can be made to meet the needs of nearly any application.